We all love pizza, I mean who doesn't? It's perfect on the go food and not only that, it can be your partner through stress-eating and break-ups (believe me, I tried this method and it worked). 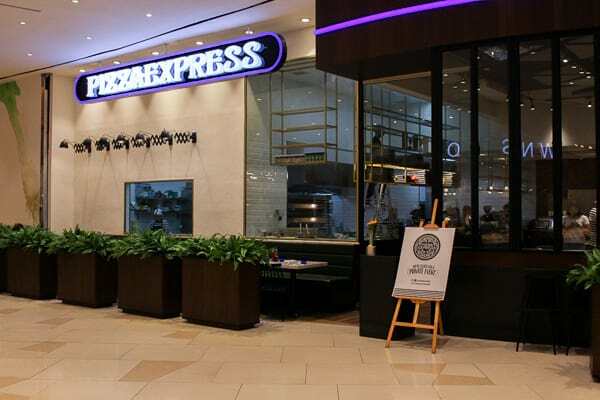 For those who want to taste a well-known pizza chain in the UK named PizzaExpress who opened their very first store in Soho, London over 50 years ago. I'm very happy to inform you that they are now available in the Philippines at Uptown Mall. This casual diner offers Italian-inspired dishes that are stylish, creative, and relevant. Although it serves the same great food across all it’s branches, each store has a distinctive style. The store in BGC boasts a map of London on the feature wall and the neutral tones used throughout are warm and inviting, perfect for a shared meal. Baked Dough Balls are a great way to get introduced to their pizzas. These bite-sized pizza doughs are served with Garlic Butter, Pesto Rosso, and pesto Genovese. Sweet-tooths can get this round treat as a dessert, too. Check out the Dough Balls with Nutella. Romana Pizza, Classic Pizza, or Pasta; one thing these carbs have in common are how consistently good they taste. Using the same dough recipe that they’ve had since the beginning, they were able to create pizzas that are both traditional and innovative. Most people keep coming back for the Lava Pizza, that’s topped with chunks of melt-in-your-mouth Burrata mozzarella, and the Spaghetti Fruitti de Mare, which is a seafood pasta in a spiced Pomodoro sauce. come and taste their Italian cuisine made from locally sourced ingredients together with imported products, handmade pizzas and be amazed at how chefs worked their magic as they create your dough from scratch at their open kitchen.